It is with a heavy heart that we call to recollection one of the greatest atrocities of the 20th century, namely, the tragic events in Ukraine during the years 1932-1933. Today, our Ecumenical Patriarchate joins Ukrainians across the globe in prayerful commemoration on the 84th anniversary of the Holodomor. Surrounded by the members of our local Ukrainian Orthodox Community and representatives of various nations serving in our City, we will preside over the celebration of the Divine Liturgy as well as personally offer a memorial service for the millions of people who inhumanely lost their lives during the orchestrated man-imposed famine. In the spirit of sharing intimately in the life of Ukraine, the Holy and Great Church of Christ stands in prayerful silence and solidarity with the victims of the Holodomor, contemplating the magnitude of death and destruction carried out by the oppressor. “You will know the truth, and the truth shall set you free.” And it is the truth of the Lord that liberates. 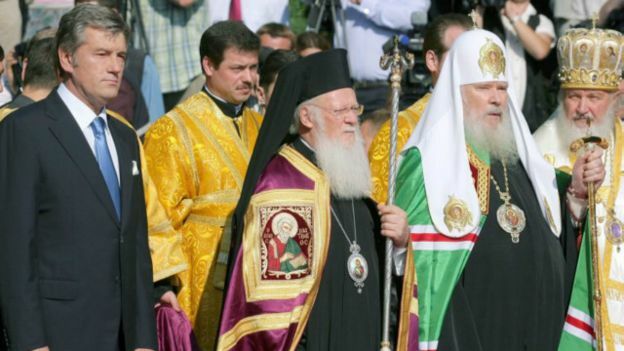 For, the world witnessed in Ukraine the destruction and death of millions of people due to falsehood and a godless ideology, but it continues to recognize the rejuvenation, baptism, and eternal life offered centuries ago by our holy predecessors, the saintly and wise Patriarchs of Constantinople. The “water road” of the Dnieper River system was transformed into a bridge leading to heaven. While prayerfully commemorating the atrocity of famine, we would also like to make a prayerful appeal to all people of goodwill for the cessation of the war, aggression and ongoing violence in Ukraine, as well as to underscore the importance of respecting human rights and dignity, most especially of the prisoners of war, for whose safety and release we Orthodox pray for at every divine service. The aggressions and crimes witnessed in the early 20th century should not be repeated once again; rather, we should strive to be mechanisms of reconciliation and rapprochement, especially having fresh in our minds the disastrous results of the conflict and hostility 84 years ago. Let us all, each from our own standpoint, personally and collectively, work to de-escalate tension and cultivate dialogue and mutual understanding, so that the dark chapters of the early 20th century will never reappear before us. Eternal be the memories of the victims of this travesty. And may peace and prosperity be granted unto Ukraine. 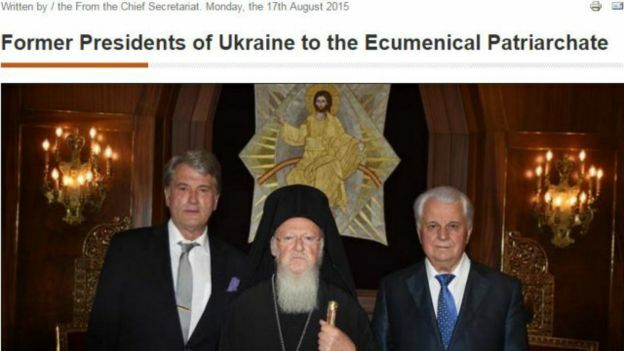 An interesting article on the quest for autocephaly for the Ukrainian Orthodox Church. 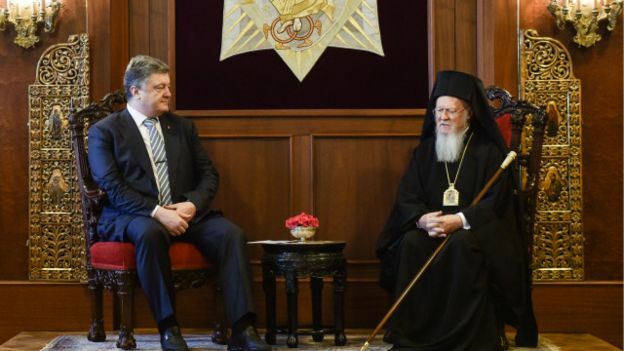 The Ukrainian Orthodox Church of Canada first began actively making the argument for autocephaly ‎with His All Holiness the Ecumenical Patriarch Bartholomew during its 2013 visit to Constantinople-Istanbul and has continued to make this case to this very day. Вперше про церковну місію двох президентів стало відомо ще у серпні 2015 року, коли про це написалагрецька релігійна інформаційна агенція Romfea, яка висвітлює життя церков у підпорядкуванні Вселенського Патріарха. On December 6. 2015 our parish held a successful Skype meeting with renowned Ukrainian poet and political activist Dmytro Pavlychko.The meeting was attended by over 100 parishoners and guests. Mr Pavlychko spoke about his visits to Canada, and in particular his time in Winnipeg. He spoke abou the role of Canada in recongnising Ukraine as well as about the current sitution in Ukraine. In conclusion, he read a new poem written for the occasion. Дорогі наші Соборяни, приятелі і всі хто підтримує наш Собор. Цього року наш Собор Покрови Пресв’ятої Богородиці відзначає 90 ліття свого заснування. Ми щиро запрошуємо всіх Вас прийняти участь у цьому святкуванні. Перше- це Групове ФОТО, яке буде взяте у неділю, 18 го жовтня, після Служби Божої на сходах церкви. 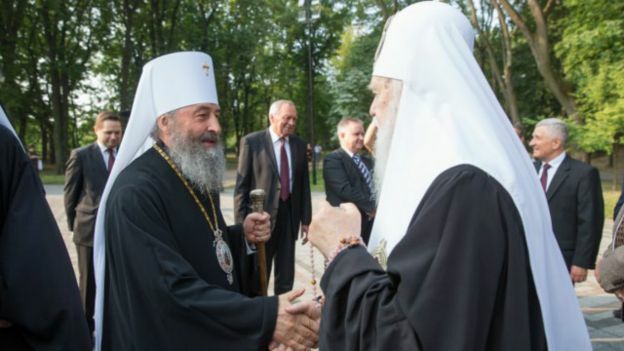 Ми всі любимо переглядати старі фото, які пригадують нам багато дорогих моментів нашого життя, та історії нашого Собору. Це фото також увійде до цієї, але новітньої історії, і буде представлене на дісплеї під час нашого святкування 1- го листопада. Просимо Вас чисельно з родинами взяти участь у знімці. (Одягніть будь ласка щось українське). Це буде нагода у спокійній, неформальній обстановці поспілкуватися, почути про історію Собору, яка є дуже багата на різні події. Переглянути старі фото та відео про життя Собору, поспівати старих та нових пісень. Запрошуються ВСІ! Приходьте з дітьми та друзями! Квиток коштує всього лиш $5, що включає один напій (вино…) і легку перекуску, бар також буде працювати. Квитки можна придбати в офісі церкви в неділю після Літургії, чи від членів Соборної управи. Всі ми знаємо, що Свято Святої Покрови випадає 14 го жовтня, але цього року 90-ліття нашої Громади ми будемо святкувати у неділю 1-го листопада. Зустріч Владики Юрія відбудеться в 9:30 ранку. Святу Літургію очолить Митрополит Юрій у співслужінні священиків. Хор ім. О. Кошеця відспіває Архирейську Службу Божу. Офіційний Святковий Обід розпочнеться в 12:30 пополудні. Квитки на Обід та урочисту програму коштують $60 для дорослих, та $20 для дітей 14 ти років та молодших. Важливо замовити квитки наперед та заплатити перед чи у неділю 25 го жовтня. Заплатити можна у церковному Офісі. Ми заохочуємо усіх Вас та Ваших приятелів з інших Церковних громад прийняти участь у нашому святкуванні!!! Сподіваємось у скорому часі побачити і привітати Вас на святкуванні нашого свята - 90 ліття заснування парафії Собору Покрови Пресвятої Богородиці! Нехай Господь Бог благословить Вас і Вашу родину! Отець протоєрей Олександр Гаркавий- настоятель Собору. Василь Балан - Голова Yправи Собору. Володимир та Сандра Литвин - Співголови Комітету по святкуванню 90 ої річниці Собору. If any man be devout and loves God, let him enjoy this fair and radiant triumphal feast. If any man be a wise servant, let him rejoicing enter into the joy of his Lord. If any have labored long in fasting, let him now receive his recompense. If any have wrought from the first hour, let him today receive his just reward. If any have come at the third hour, let him with thankfulness keep the feast. If any have arrived at the sixth hour, let him have no misgivings; because he shall in nowise be deprived therefore. If any have delayed until the ninth hour, let him draw near, fearing nothing. If any have tarried even until the eleventh hour, let him, also, be not alarmed at his tardiness; for the Lord, who is jealous of his honor, will accept the last even as the first; he gives rest unto him who comes at the eleventh hour, even as unto him who hath wrought from the first hour. And he shows mercy upon the last, and cares for the first; and to the one he gives, and upon the other he bestows gifts. And he both accepts the deeds, and welcomes the inten­tion, and honors the acts and praises the offering. Wherefore, enter ye all into the joy of your Lord; and receive your reward, both the first, and likewise the second. You rich and poor together, hold high festival. You sober and you heedless, honor the day. Rejoice to­day, both you who have fasted and you who have disregarded the fast. The table is full­-laden; feast ye all sumptuously. The calf is fatted; let no one go hungry away. Enjoy ye all the feast of faith: Receive ye all the riches of loving-kindness. Let no one bewail his poverty, for the universal kingdom has been revealed. Let no one weep for his iniquities, for pardon has shone forth from the grave. Let no one fear death, for the Savior's death has set us free. He that was held prisoner of it has annihilated it. By descending into Hell, He made Hell captive. He embittered it when it tasted of His flesh. And Isaiah, foretelling this, did cry: Hell, said he, was embittered, when it encountered Thee in the lower regions. It was embittered, for it was abolished. It was embittered, for it was mocked. It was embittered, for it was slain. It was embittered, for it was overthrown. It was embittered, for it was fettered in chains. It took a body, and met God face to face. It took earth, and encountered Heaven. It took that which was seen, and fell upon the unseen. O Death, where is thy sting? O Hell, where is thy victory? Christ is risen, and thou art overthrown. Christ is risen, and the demons are fallen. Christ is risen, and the angels rejoice. Christ is risen, and life reigns. Christ is risen, and not one dead re­mains in the grave. For Christ, being risen from the dead, is become the first-fruits of those who have fallen asleep. To Him be glory and domin­ion unto ages of ages. Amen. Якщо хто благочестивий і любить Бога, нехай насолодиться цим світлим торжеством. Якщо хто раб благорозумний, нехай увійде, радіючи, у радість Господа свого. Якщо хто потрудився, постячися, нехай прийме нині винагороду. Якщо хто від першої години працював, нехай отримає нині справедливу заплату. Якщо хто після третьої години прийде, дякуючи, нехай святкує. Якщо хто після шостої години з'явився, нехай не засумнівається, тому що нічого не втратив. Якщо хто затримався до дев'ятої години, нехай з'являється без усякого сумніву, нічого не боячись. Якщо хто прийшов тільки об одинадцятій годині, нехай не тривожиться тим, що запізнився, бо щедрий Владика і останнього приимає нарівні з першим; заспокоює того, хто прийшов об одинадцятій годині, як і того, що працював від першої; і останнього милує, і про першого турбується, і тому дає, і цьому дарує. І діла приймає, і наміри вітає, і діяння шанує, і думки хвалить. Тому-то увійдіть всі в радість Господа свого: і перші, і другі, винагороду прийміть. Багаті і бідні, один з одним святкуйте! Стримані і ліниві, день вшануйте! Ті, що постилися, і ті, що не постилися, - звеселіться сьогодні! 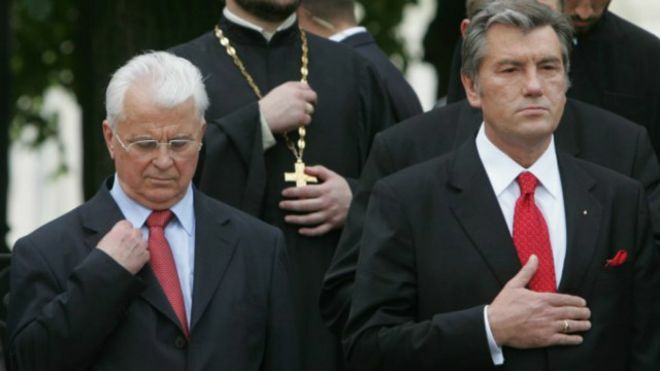 Трапеза готова: насолоджуйтесь усі! Тілець вгодований, нехай ніхто не вийде голодним, всі прийміть багатство благости! Ніхто нехай не ридає від убо­гости, тому що явилося загальне Царство. Ніхто нехай не оплакує гріхів: прощення бо засяяло із гробу! Ніхто нехай не убоїться смерти, визволила бо нас Спасова смерть; схоплений нею -подолав її. Зійшовши в пекло - полонив пекло, засмутив його, коли воно спробувало плоті Його. Це й Ісайя передбачив, коли взивав: пекло засмутилося, зустрівши Тебе в безодні. Засмутилося, бо знищене; засмутилося, бо зневажене; засмутилося, бо смерть йому заподіяно; засмутилося, бо повалене; засмутилося, бо зв'язане. Узяло тіло, а знайшло Бога; взяло землю, а зустріло небо; взяло те, що бачило, а впало через те, чого не бачило. Де твоє, смерте, жало? Де твоя, пекло, перемога? Воскрес Христос - і ти по­валене! Воскрес Христос - і попадали демони! Воскрес Христос - і радіють ангели! Воскрес Христос - і життя триває! Воскрес Христос - і немає жодного мертвого в гробі! Свято було встановлене пiсля перемоги над iконоборчою єрессю. Але оскiльки перемогою над цiєю єрессю св. Церква остаточно розкрила православне християнське вiровчення i сформулювала його у постановах семи Вселенських Соборiв, то подiя ця називається не торжеством iконошанування, а Торжеством православ'я. Це не означає, що пiсля середини IX столiття бiльше не з'являлося єресей; це значить, що всi наступнi єресi, якими б вони не були численними i рiзноманiтними, осуджуються постановами семи Вселенських Соборiв. Православнi християни вшановують Господа нашого Iсуса Христа, Його Пречисту Матiр i святих, зображених на iконах, а не дошки i фарби. Крiм того, друга заповiдь Божа забороняє поклонятися iншим богам-iдолам, а не iстинному Богу. Ми - православнi християни - поклоняємося через шанування iкон iстинному Богу, Господу нашому Iсусу Христу, а не iдолу. Для нас Христос Спаситель - iстинний Бог, а не iдол. Церква закликає нас: "Прийдiть, поклонiться священним образам Христа, Пречистої Його Матерi i святих i вiдкиньте злочесну вiру тих, хто лихословить". The Sunday of the Triumph of Orthodoxy is celebrated on the first Sunday of Great Lent. It is the celebration of the victory of the iconodules over the iconoclasts by the decision of the Seventh Ecumenical Council. Therefore, the service is to commemorate the restoration of icons for use in services and private devotional life of Christians. Services often include the clergy or the faithful triumphantly processing around the church, holding icons of their patron or parish saints. In areas where multiple jurisdictions exist (such as the United States), Pan-Orthodox Vespers are also usually celebrated in the evening. Each of the Sundays of Great Lent has its own special theme. In the course of Church history, almost each Lenten Sunday has obtained a second theme, a historical theme. Originally the Lenten fast was the time for catechumens to prepare for baptism and entry into the Church. The Sunday spiritual themes were part of the early Christian catechesis. During Holy Week, the Orthodox Church remembers the final days of the Savior’s earthly life—His deeds and talks with His disciples, the institution of the Mystery of the Eucharist, Judas’s betrayal, the Lord’s captivity, His sufferings and humiliation, crucifixion, death, and burial. Click here to see a collection of unique Icons showing the different aspects of Holy Week.